Paul Pogba may be criticised the world over for his questionable hair styles and his millennial attitude, but when he steps foot inside the confines of a football pitch, he hardly leaves anything to chance. Pogba is a man who has had his doubters for way too long now, and at 25 years of age, that number may only increase. 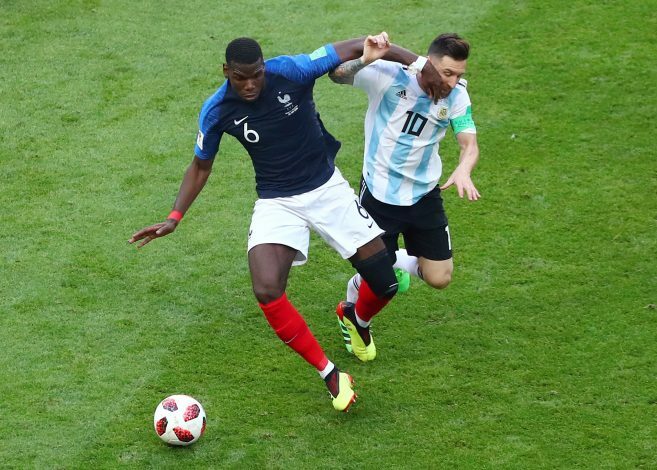 But if you’re wondering what the Frenchman is truly all about, just go ahead and ask his peers and teammates, who have been very forthcoming about Pogba’s natural ability with a ball at his feet. But if a documentary entitled “Les Bleus 2018: au cœur de l’épopée russe” (The Blues 2018, at the heart of their Russian epic) is to be believed, he’s also an undisputed leader in the dressing room. The film shows the Manchester United star offering an inspirational team talk ahead of Les Bleus’ Round-of-16 tie against Argentina, where he can be seen motivating his teammates to give it their all – in the most Paul Pogba way possible of course. “The details boys. Fellas! We want warriors on the pitch today,” Pogba highlighted. “I don’t want to go home tonight. Me, this evening, I’m not going home. Tomorrow, we’re staying at the hotel. “We’re going to eat that f—ing sauteed pasta again. I don’t give a s—, we’re not going home. We’re going to finish happy. I want us to have a party tonight. “I want everyone. Today, we run ourselves to death out on the pitch. No one lets anyone else down. No one drops off. On the pitch, we’re all together. Good guys and warriors. Soldiers.